This tool is to create a desktop wallpaper calendar. Drag the mouse to change the calendar positions. Changing the display magnification to 50% or 25% makes dragging easier. It will take some seconds after the "Generate image" button is pressed to generate the wallpaper calendar. If the aspect ratio of the loaded image and the wallpaper calendar to be generated are not the same, two edges may be cut off. "Cut off" slider can be used to select those areas. 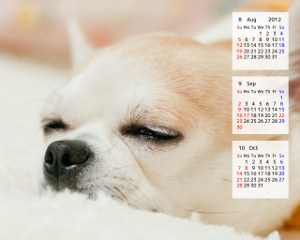 This tool can generate wallpaper calendar with width and height of up to 2100 pixels each. Some font names may not display properly. If the font that you selected does not contain a particular character, a substitute font will be applied to the missing character. The loaded image will not be sent to the server. The wallpaper calendar will be generated on the client (your computer) side. Use numerals and the forward slash ( / ) to add holidays to the "Holidays" field, one date per line.